Capturing realism in a miniature subject is the main focus of my work. The seasons will also influence my creativity depending on the nature that is around at a particular time. 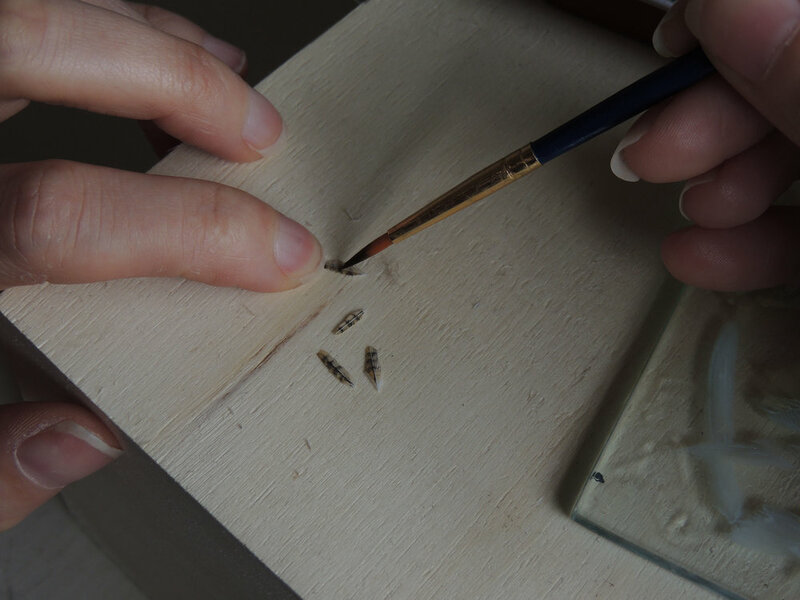 Due to the intricacy and intense concentration required for me to make a miniature sculpture, I will often rotate the style and subject of my artworks and experiment with new techniques. This helps avoid too much repetition and creative burn out. 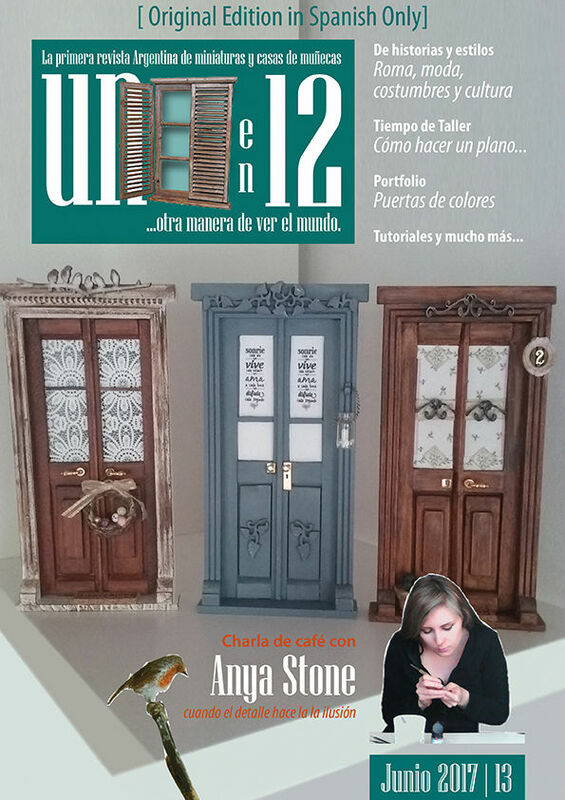 This page covers just a few of the stages and techniques that are involved in the hope of creating a simulacrum of miniature proportions. 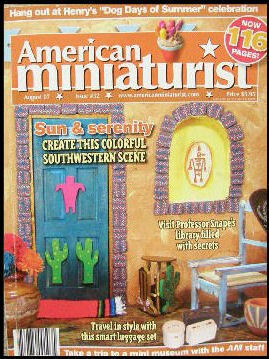 Some miniature sculptures require more planning to make than others. In this instance they are designed on paper first for a visual reference, especially when working on concept ideas including fantasy work. Facial expressions and character are very important and to enhance these qualities my sculptures eyes are set with high grade glass or semi precious stone to give them a life like appearance. Realistic fur coats and plumage are made with cruelty free fibers from animal sanctuaries or naturally moulted feathers. I fix these on to the sculpture using high quality adhesives. The fibers can be cut to different lengths, dyed or hand painted. Flocking is a technique where fiber is cut into a sawdust - like consistency and adhered to a surface. It was originally invented to imitate the elaborate designs of wall hangings in the 16th century, but its uses have grown since. 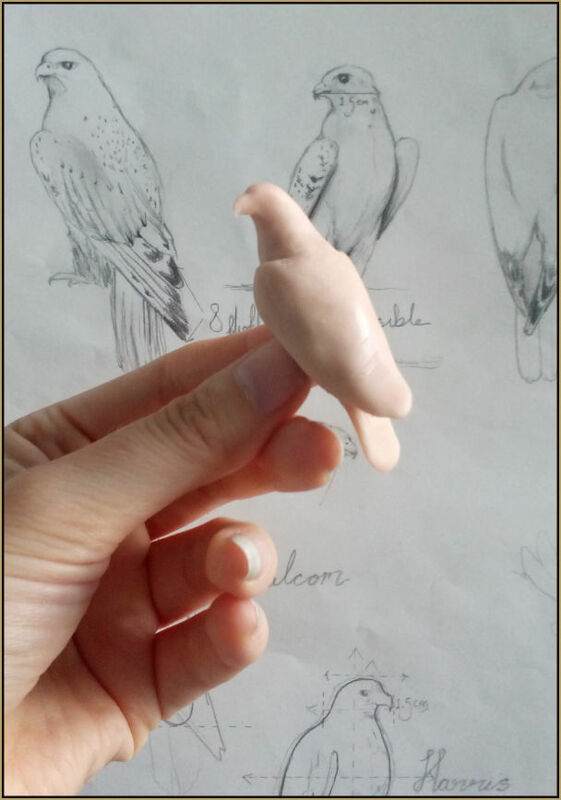 Where flocking is used on my sculptures, I build up the fiber particles gradually with a small flat brush to control the direction of the fiber. Ground fiber is another method that I use for making fur for miniatures to create the illusion of even finer fur. Above photo: Miniature feathers to be used on a 1:12th scale little owl made from Mallard & goose feathers and painted with fabric paints using a 2.0 pointed brush. Not all colours that are available commercially are suitable to imitate miniature bird plumage, so for this reason many colours are customised beforehand to bear a closer resemblance to the real bird. 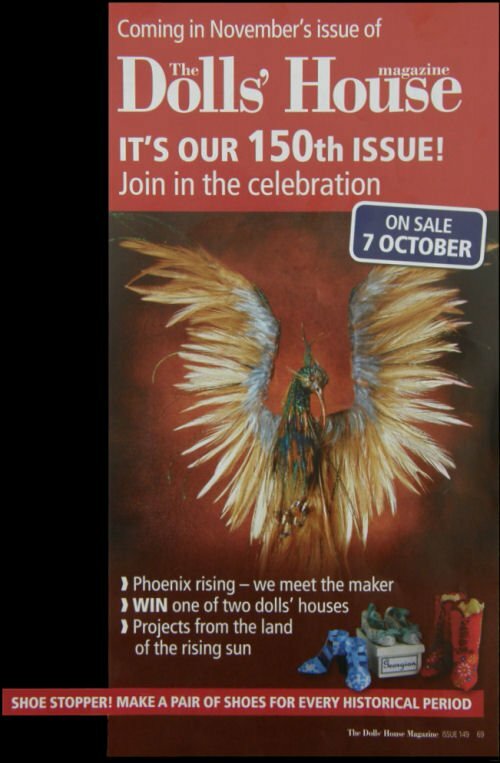 The process involves washing and sterilising the feathers first; afterwards they can be dyed or hand painted. 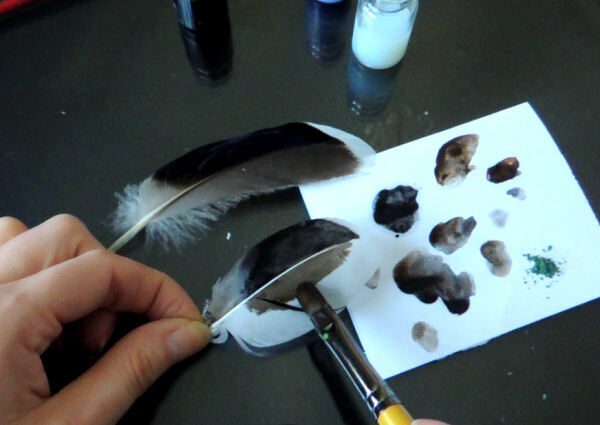 The slideshow below demonstrates how a natural white feather is painted to resemble a real mallard feather using customised colours. 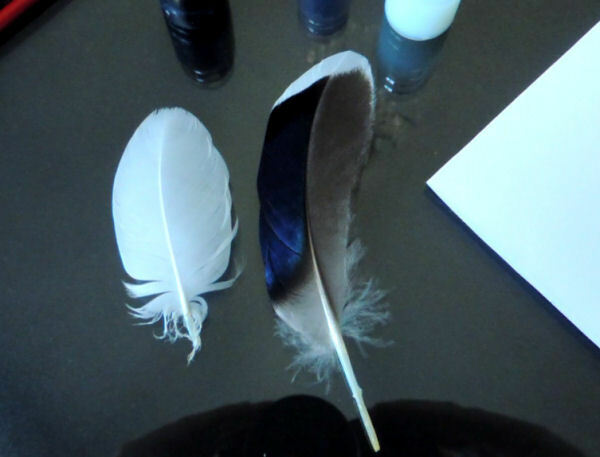 The process can be seen up close with real size feathers by clicking on the photos below. 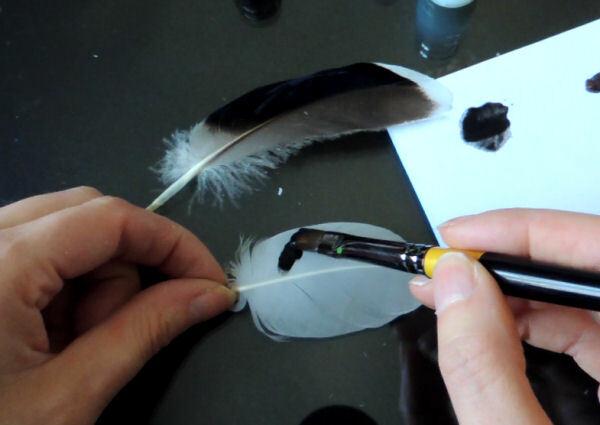 Little owl in progress: Attaching feathers using precision tip tweezers.